Are you looking for an easy gift idea? 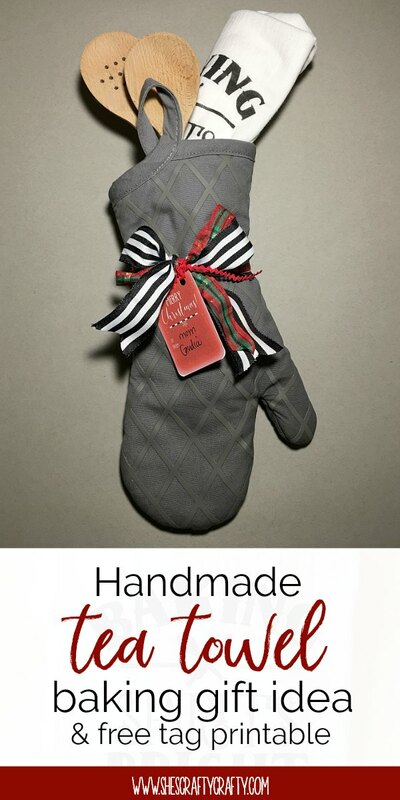 Don't miss this Handmade Tea Towel Baking gift idea with free printable gift tag. Tea Towels are so popular right now. 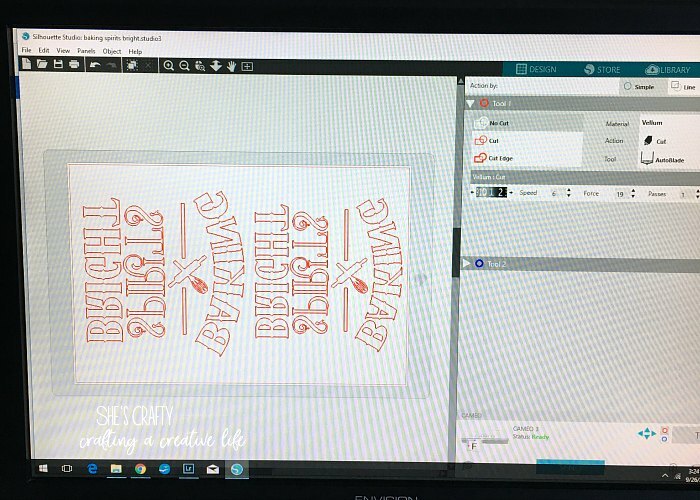 I made a Christmas tea towel that would be great to put together in a baking set. I'll show you how! I bought these towels at Walmart. I think the package of 5 cost around $4. 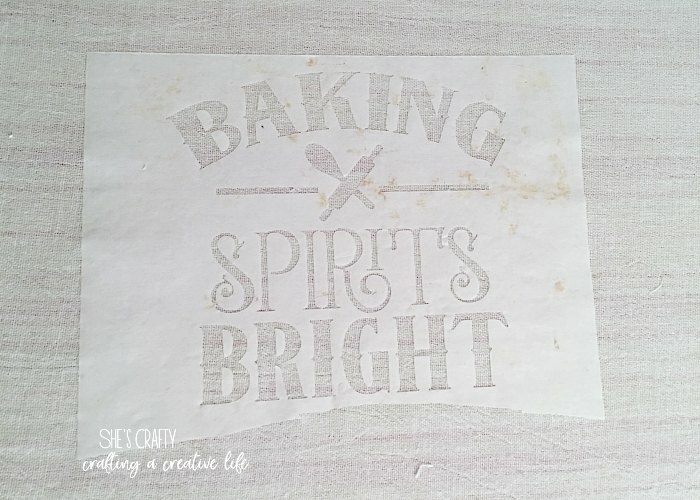 I used freezer paper to make a stencil just like I did here. I cut the freezer paper with my Silhouette. I find it so much better to put the paper on the cutting mat upside down (shiny side up). It cuts so smoothly this way. since the freezer paper is upside down. 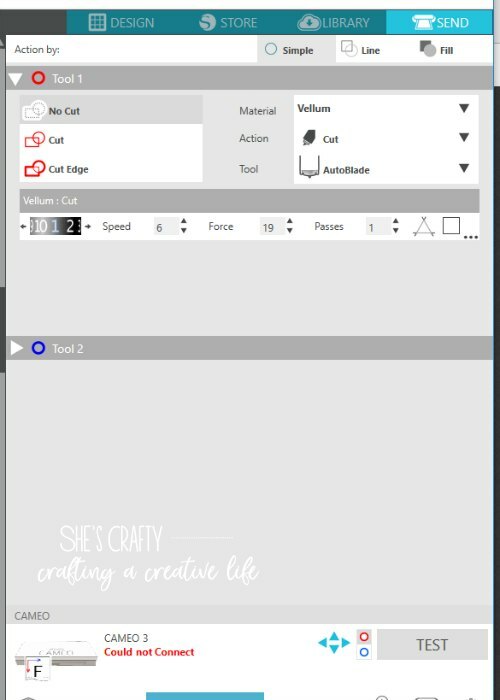 These are the cutting settings I use to cut freezer paper with my silhouette. After it's cut, iron it onto the towel. 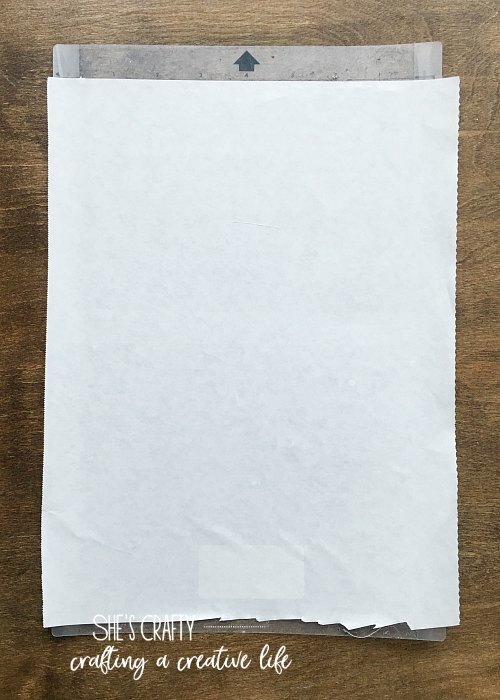 The wax on the paper melts and sticks to the fabric, and that creates a stencil. 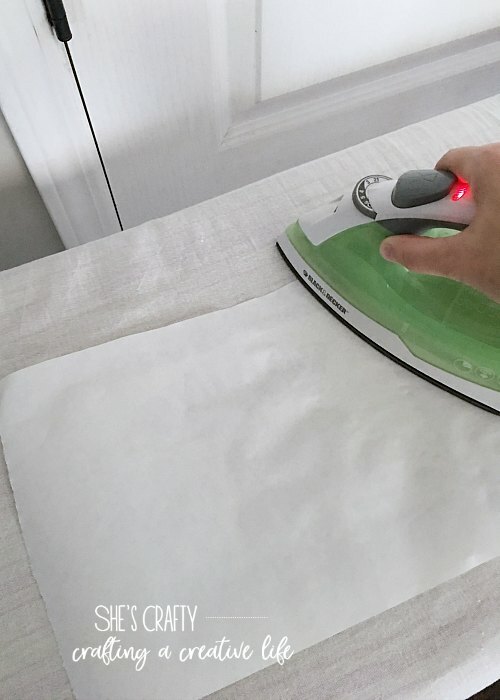 Don't forget to iron another piece to the back of the towel. This prevents paint bleed through. 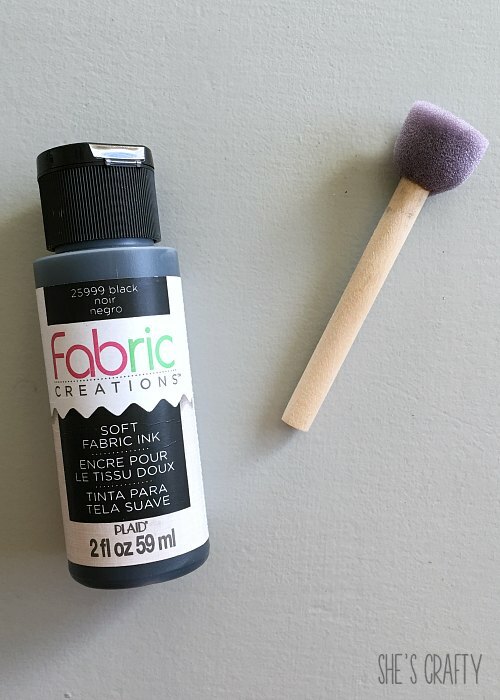 Use fabric paint and a sponge pouncer to apply fabric paint. When applying the paint, load the sponge, then pounce it up and down on the towel. Do not brush it side to side or the paint could seep underneath the stencil. Also, make sure to use paint specifically for fabric. It is softer and the towel washes really nicely. 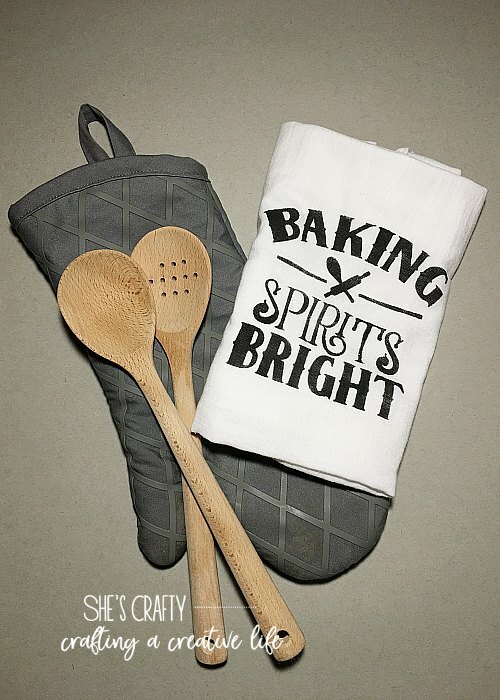 I put together a gift with the DIY tea towel, wooden spoons (similar here) and an oven mitt (similar here). This would be a great gift for anyone. 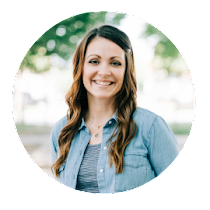 A mom, a friend, a sister, a lady at church- anyone! 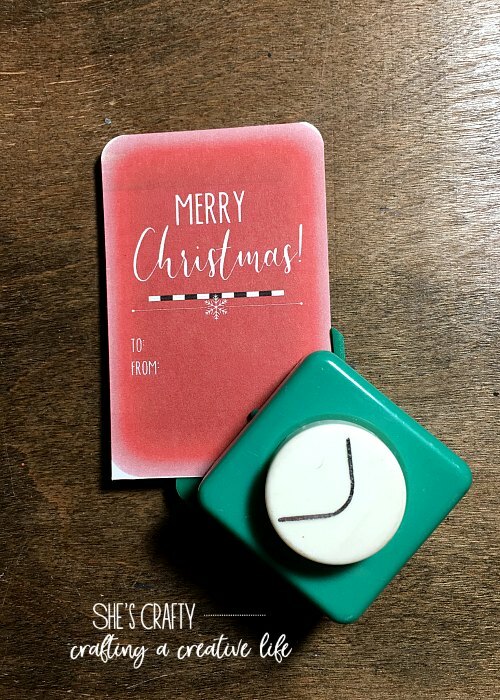 I made a gift tag to go with the gift. 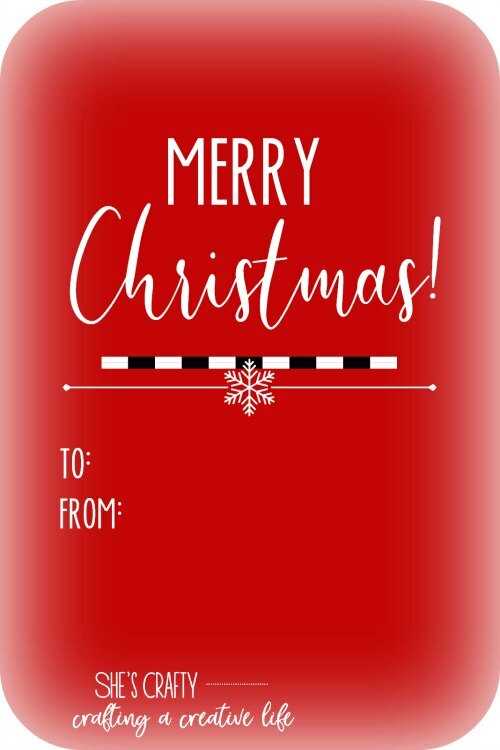 You can get a copy of the Christmas tag free printable. I printed it in wallet size on white cardstock. Then I punched the corners with a corner rounder. I'm pretty sure my corner rounder is so old, it's practically an antique. You can get a similar one here. 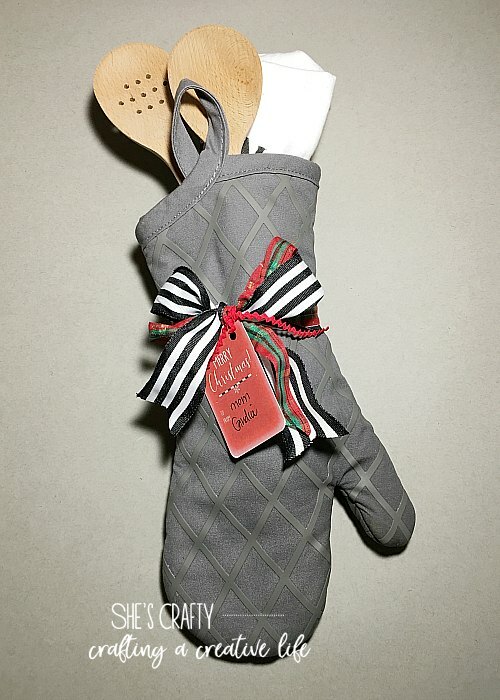 I tied the oven mitt with ribbon and then tied the tag onto it. 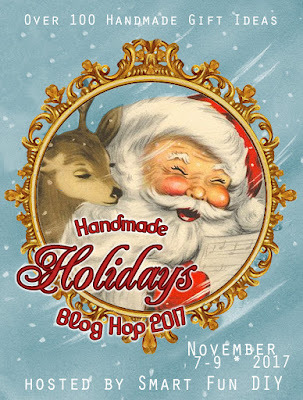 This project is a part of a Handmade Holiday blog hop! Check out all of the other Handmade Holiday Gifts and enter the give away! I love personalized gifts like this. I feel they just mean so much more. 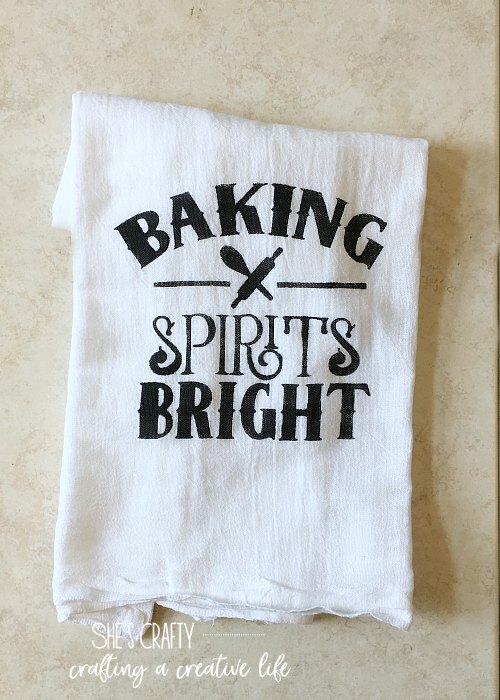 Nice gift idea--I like the saying on the towel. I love a themed gift and your presentation of it is so cute! This is so cute! When I first saw it, I thought you bought the tea towel like that- I'm SO impressed how cute your stencil turned out!!! Love it! What a great idea for a gift! I've never used freezer paper with my silhouette yet! 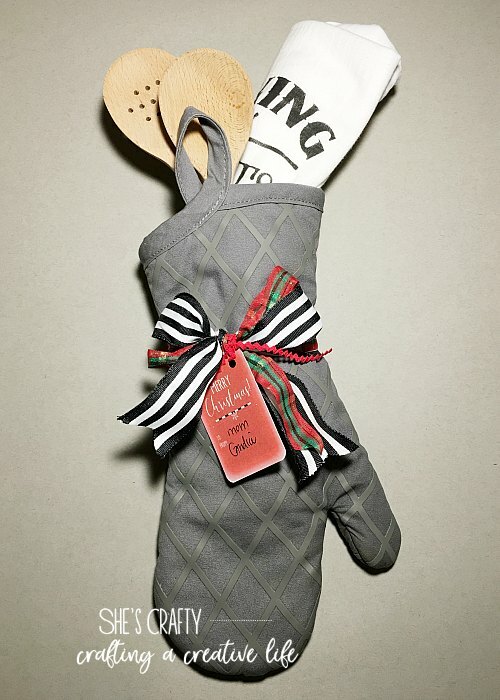 I love the idea to use it on tea towels!! It's one of my favorite things to do! What a lovely idea! 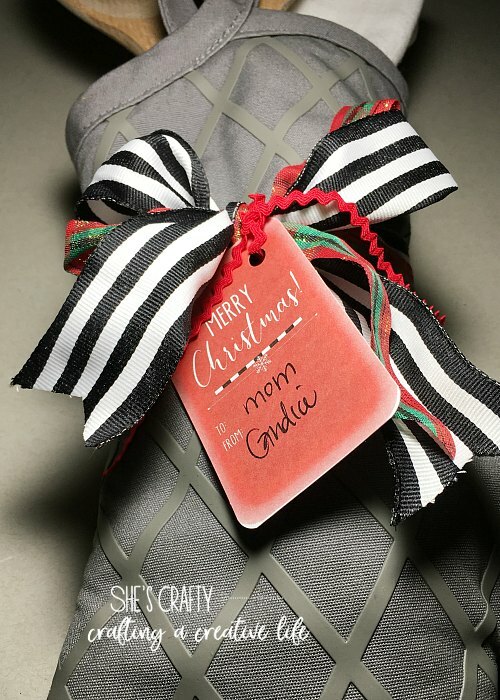 Such a thoughtful gift idea too, especially since its handmade. 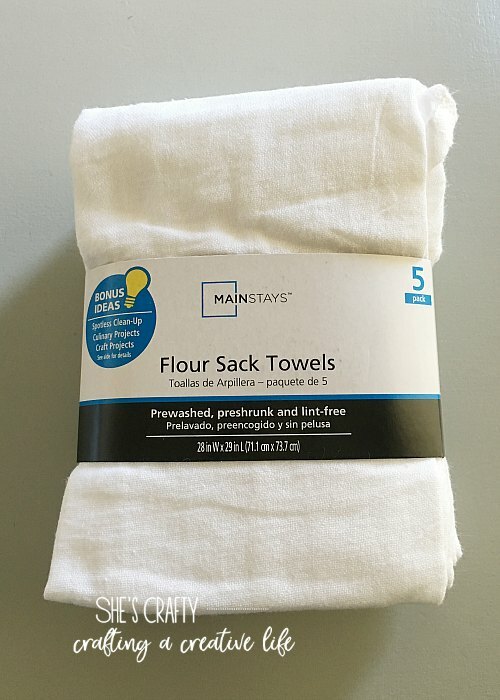 I love these, never thought it was this easy to make these towels. Very nice set. Love the saying! Such a sweet gift idea. Love it! Um, holy cow. I have never done this and totally need to now! Turned out darling! I would totally love a gift like this! 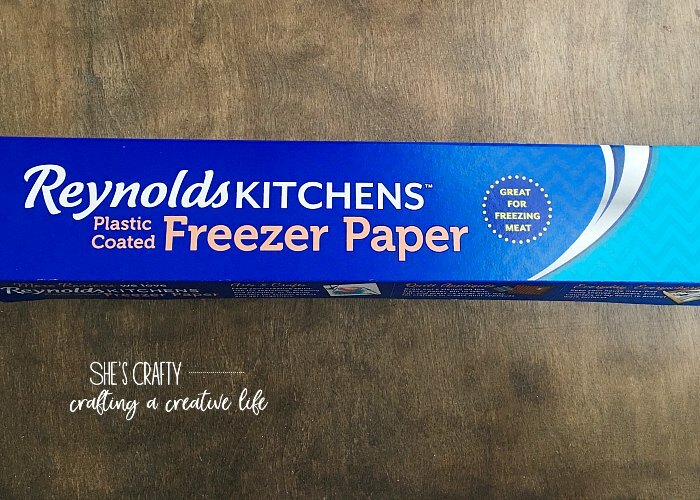 I really want to try this freezer paper technique. This is such a cute gift idea. I love the saying on it.